This charmer, known as Kengoro, can swing a tennis racket, do pull-ups, and stand on his toes. Photo: Asano, Okada, Inaba, Science Robotics. Japanese scientists are hard at work trying to create the only kind of robot that matters in this hopeless hellworld: one capable of pulling off an inspirational training montage, glistening robo-muscles and all. 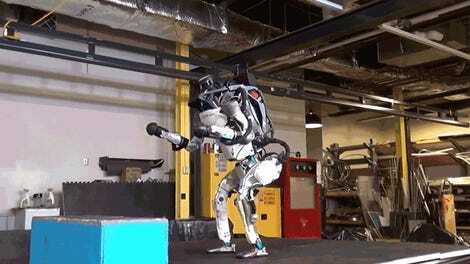 Their latest efforts have been detailed in a paper published in Science Robotics earlier this month, complete with videos that show off the robots’ workout routine. Researchers at the University of Tokyo’s Johou Systems Kougaku laboratory designed their robots to not only look like people but to walk and move like them as much as possible. 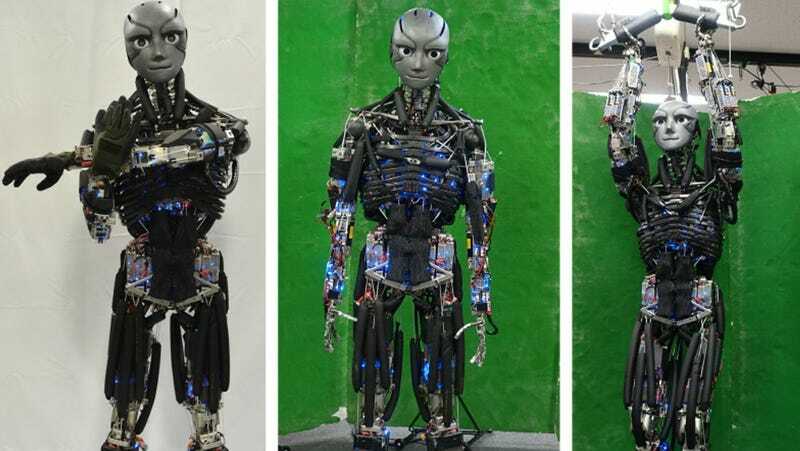 So unlike other humanoid robots, their creations have anatomically correct musculoskeletal structures like spinal joints and their body mass and proportions resembles our own. The latest two are named Kenshiro, modeled on a 13-year-boy, and Kengoro, which is newer and slightly heavier. Most freakishly of all, Kengoro even sweats like us. That last bit is more due to quick thinking than an initial attempt at human mimicry, though. As detailed in a paper published by the researchers last year, they came up with the sweating feature as a way to avoid adding the bulky equipment that machines often need to keep from overheating. With the help of a powerful laser that punched tiny holes in the aluminum they used as Kengoro’s bones, they created a porous frame that would passively move water all along the robot as it performs its actions. The water then cools the robot down as it reaches an outside layer of the skeleton and evaporates, taking heat away with it. This set-up, while not as effective as an active cooling radiator, keeps Kengoro lighter and able to perform push-ups for 11 minutes straight without interruption. Just like us, though, he can’t sweat forever without refueling—the robot requires at least a cup of deionized water every 12 hours to operate. The team’s latest paper details how close their robots have gotten to mimicking human movement—and how far they have to go before we have to worry about any T-800s looking for Sarah Connor. Kengoro, for instance, can do pull-ups, swing a tennis racket, and stand on his toes thanks to 100-plus motors (and plenty of wires) used to mimic the contraction of muscles. 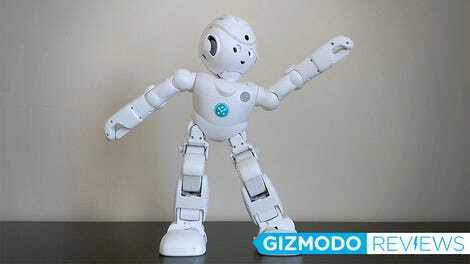 Altogether, Kengoro’s joints can perform more than 100 different kinds of movement, also known as degrees of freedom, making him the current humanoid robot record holder, according to the researchers. That’s still only about a quarter of the movement that our joints (excluding the face) are capable of, though. Besides making movies like Blade Runner more plausible, perfecting robots like Kengoro has plenty of real world value. The authors think these bots, once scaled down to be affordable, could be used everywhere, from serving as better crash dummies to helping grow tissue grafts. And, of course, the better we get at making robots that can mimic human movement, the better we get at making artificial limbs.